Philippe Raffin poses with a section of a Wattway solar road, solar tiles that adhere to existing roadways in order to produce electricity. Developed in France, a ten-by-twenty-foot section can supply the electricity requirements for an average French home. More than 160,000 miles of asphalt comprise the U.S. National Highway System. On 18 of them, located south of Atlanta, Georgia, an initiative called The Ray is working to reimagine what a highway could be. The Ray aims to morph this stretch of road into a positive social and environmental force—the world’s first sustainable highway. Electric vehicles (EVs) are a focal point. Currently, more than 100,000 tons of carbon dioxide are emitted along the 18-mile corridor each year. To shift that, The Ray is creating infrastructure for EVs, including a solar photovoltaic (PV) charging station. Clean energy is central. 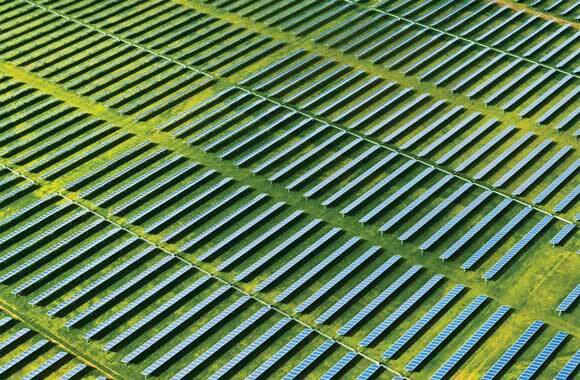 The Ray will feature a 1-megawatt PV farm along its right-of-way. Exposed 90 percent of the time, road surfaces themselves are prime for solar generation. The aptly named Wattway PV pavement, a French technology, will allow The Ray to produce clean electricity, while improving tire grip and surface durability. Modern motorways have seen little advancement in design since their inception. Now, climate change and the arrival of electric and autonomous vehicles are placing new demands on them. Highways need a smarter way forward. The Ray may prove that this dirty infrastructure can become clean, safe, and even elegant. U.S. National Highway System: U.S. Federal Highway Administration. “Our Nation’s Highways: 2011.” https://www.fhwa.dot.gov/policyinformation/pubs/hf/pl11028/chapter1.cfm. Ray C. Anderson [and] Interface: Anderson, Ray C. Confessions of a Radical Industrialist. New York: St. Martin’s Press, 2009. The Ray…first sustainable highway: The Ray. http://theray.org. network of paved roads…throughout the Roman Empire: Hitchner, R. Bruce. “Roads, Integration, Connectivity, and Economic Performance in the Roman Empire.” In Highways, Byways, and Road Systems in the Pre-Modern World, edited by Susan E. Alcock, John P. Bodel, and Richard J. A. Talbert, 222-234. Chichester, West Sussex: Wiley-Blackwell, 2012.
carbon dioxide [emissions] along the…corridor: Dagenhart, Richard, et al. The Future of Highways. Atlanta: Georgia Conservancy and School of Architecture, Georgia Institute of Technology, 2014.
state of Georgia…EV registrations: U.S. Department of Energy. “Georgia Sets the Pace for Plug-In Electric Vehicles.” Alternative Fuels Data Center. February 3, 2015.
road surfaces…for solar generation: Wattway. “Paving the Way to Tomorrow’s Energy.” Press kit. October 2015. “Route 66 of the future”: Kelion, Leo, and Colin Grant. “Motorway of the Future Uses Glow-In-the Dark Road Paint.” BBC News. May 1, 2013; Studio Roosegaarde. “Smart Hightway.” https://www.studioroosegaarde.net/project/smart-highway/info/. The artificial leaf is technology inspired by photosynthesis. It combines solar energy, water, and carbon dioxide, to feed bacteria that synthesize energy-dense fuel. Autonomous vehicles are on the rise. They have the potential to shrink the auto fleet and accelerate ridesharing and the adoption of electric vehicles. Rooftop solar is spreading as its cost falls, driven by incentives to accelerate growth, economies of scale in manufacturing, and advances in photovoltaic technology. Solar farms tap the sun’s virtually unlimited, clean, and free fuel, using large-scale arrays of hundreds, thousands, or in some cases millions of photovoltaic panels.